Marrakech is a dazzling, chaotic city, set at the foot of the Atlas Mountains in Morocco. A holiday to Marrakech is like nothing you’ll have ever experienced before – as you step into its winding streets full of market stalls, musicians, street performers and donkeys. Just being here and absorbing the heady atmosphere is an experience in itself, but no visit is complete without checking out some of the fascinating and beautiful Marrakech historical monuments. The Bahia Palace will give you a taste of what life was like for the very rich in the 19th century. The site is said to be originally built as a harem’s residence by the infamous Si Ahmed ben Musa. For all its notoriety it’s an excellent example of Noveau-Riche Eastern Architecture. Expect to find lavishly decorated interiors, zouak painted ceilings, a tiled courtyard and beautiful 8 hectare gardens. A Marrakech site not to be missed. The Koutoubia Mosque is the largest mosque in Marrakech. Built around 1150, the exceptionally beautiful and 65 metre high minaret dominates the city’s skyline. It’s also the oldest of the three great Almohad minarets remaining in the world. Although this is still a place of worship it’s one of the best places to visit in Marrakech and visitors are welcome if they dress appropriately. Rub’ al Khali or Empty Quarter is the largest sand desert on earth. Holidays to Marrakech can also include a trip to the Sahara. Camel treks or desert tours are a popular choice and it’s actually possible to reach the world’s second largest desert in two days. Sahara highlights include the Erg Chigaga sand dunes and visiting Bedouin camps with the chance of sleeping overnight under the stars. These unusual botanical gardens were designed in the 1920s by French artist and colonial expatriate Jacques Majorelle. Definitely one of the most beautiful places to visit in Marrakech, the peaceful Majorelle Garden offer a welcome respite from the busy streets and also some great photo opportunities. The gardens are cleverly designed with water features and over 300 species of subtropical plants including many types of cactus. The Souk Bazaars are an unmissable part of a trip to Marrakech. The Medina (the historic district of the city) is the best place to start your shopping. Here you’ll find endless labyrinths of souks selling everything from spices to kaftans and plenty of snake charmers, acrobats and musicians hanging out in-between. Just remember to haggle well. This is an excellently preserved 16th-century Koranic school and North Africa’s largest such institution. It could also easily take the title of one of the most beautiful schools in the world. The building is intricately designed and exceptionally detailed featuring a courtyard richly carved in cedar, marble and stucco. As many as 900 students has passed through its doors over the years but has since been closed, refurbished and then reopened to the public as an historical site of interest. While actually only the remains of a palace, the historical site is still one of the most important and beautiful places to visit in Marrakech. The original building was built by the Saadian king Ahmad al-Mansur in 1578 and was thought to have taken over 25 years to construct. All of the 360 rooms and courtyard were once was once richly decorated with no expense spared – Italian marbles feature heavily and large amounts of gold were imported from Sudan. You’ll even find a small underground jail where the king used to keep his unlucky prisoners. Individual tomb on the Ruhestätte of the Saadier dynasty (1549–1664) in the city of Marrakesh, Morocco. These Marrakech tombs were only recently discovered but they actually date back from the 16th century. The tombs are beautifully decorated with fine cedar wood, polychromic tiling and stucco work. Its a small site comprising of three rooms but they contain corpses of about sixty members of the Saadi Dynasty. Outside the building is a garden and the graves of soldiers and servants. As this is one of the most popular places to visit in Marrakech make sure you arrive early in the morning or late in the afternoon to avoid the worst of the crowds. 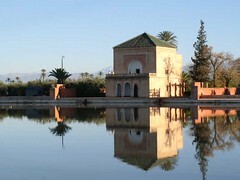 Located to the west of Marrakech and at the foot of the Atlas Mountains are the Menara Gardens. Originally formed in the 12th century as olive, palm and fruit orchards the gardens are now a beautiful and peaceful visitor attraction. It also features a formal pool overlooked by a pavilion which was previously used by the sultan and his family as a summer residence. 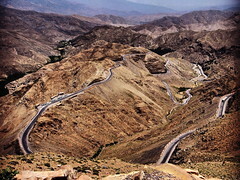 This is the highest pass through the Atlas Mountains – a long and winding road which links Marrakech to the pre-Sahara oases. Built by the French in 1930s, it’s a well constructed route offering incredible views. If you’re brave enough, you can follow the route through villages which perch precariously right on the edge of deep chasms. If you continue far enough you will also eventually reach the highest point in the road at the Tizi n’Tichka pass which stands at 2260 metres. Morocco Tours – Desert Tours from Marrakech – Guided Tours of Morocco. Posted on 19th December 2013 by newsafrica. This entry was posted in Africa, Environment, Headlines, Human Development, Morocco. Bookmark the permalink.